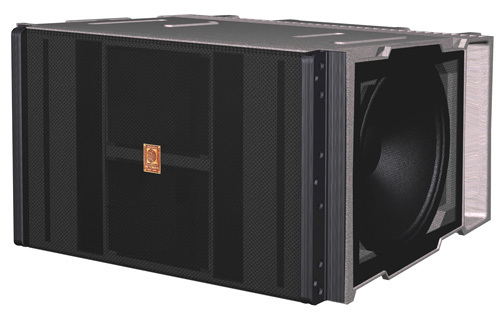 The sound reinforcement system shall hold two 1.4” HF drivers, each on a horn with a horizontal dispersion of 90 degrees and a vertical dispersion of 2.5 degrees, four low-weight neodymium 6.5” drivers and two low-weight neodymium 12-inch drivers. The maximum peak output of the total system shall be 144dB at 1m. The syste¬m shall have a 60Hz-20kHz frequency range. The system shall have a 90 degrees horizontal and 6 degrees vertical coverage angle. The cabinet shall be constructed of carbon-fiber composite, covered by a protective polyurethane coating. The total system weight shall be 40kg only. The system shall be a 3-way / 4-channel driven module within an array of sound reinforcement systems. The system shall have a software prediction tool to determine the angles between adjacent cabinets and the settings for the processing unit. LF1 Transducer (pin 1) 12"
LF2 Transducer (pin 2) 12"
MF Transducer (pin 3) 4 x 6,5"
Rigging points Fully Integrated Easy-rig Flying System.